Children of in the corn. Whether you want to test your innate sense of direction or are hoping to stumble upon a crop circle, the Chippewa Valley has corn mazes a-plenty to trick and frustrate you with clues, dead ends, and acre after acre of tall, obscuring stalks. N7240 810th St., Elk Mound • 879-5179 • www.pleasantvalleytree.com • Pleasant Valley’s two-and-a-half acre maze may be “one of the nicest we’ve ever had,” Robin Scharlau said a few weeks before opening. “In fact, one of our kids got lost.” Open Sept. 26 to October, the corn maze features a different design each year, including the new expanded magical woodland maze. 6470 Balsam Road, Eau Claire • 839-8370 • www.eauclaireorchards.com • It takes about 30 to 45 minutes to solve this maze. The kid-friendly labyrinth is a bit harder than it has been in previous years, even if it is just over two acres. Open Aug. 21 to early November. Corner of County Hwy J & County Hwy K, Chippewa Falls • 720-1663 • www.autumnharvestwinery.com • This three-acre maze, open September through Halloween, is a kid-friendly venture that children as young as 5 or 6 could solve. The random pattern with dead-ends also has hidden friends in certain areas, such as deer or scarecrows. Perhaps the best part of this maze is that it’s free! 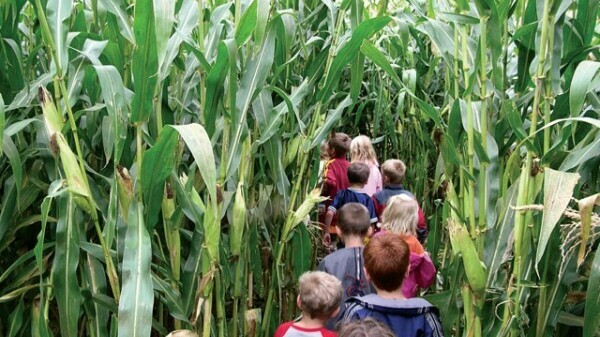 8966 County Hwy X West, Chippewa Falls • 720-0192 • Open from Sept. 19 until Oct. 31, Hawkins’ corn maze is a 10-acre adventure with farm- and fall-related trivia throughout. “Providing an education without them knowing it,” Sara Hawkins said, adding that the maze is a hit among school groups. “And we don’t make it so complicated that you get frustrated,” she added of the family-friendly feature. Once you’re out, head to the petting zoo or stuff your own life-size scarecrow. 12756 132nd St, Chippewa Falls • 288-6348 • Within their three-acre corn maze are family-oriented games such as pumpkin bowling, beanbag toss, and checkers played with gourds. Klinger also has an indoor straw maze for the younguns, both of which are open through October.